In 2012, the NCJFCJ passed a resolution in support of courts and schools working together to ensure educational opportunities for all children and to reduce inappropriate referrals to court. 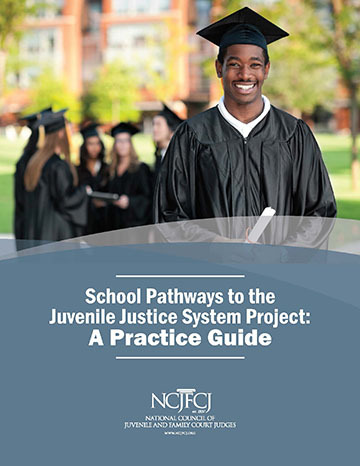 Also in 2012, the NCJFCJ was awarded funding from several foundations and the Office of Juvenile Justice and Delinquency Prevention for a project to develop, test, and disseminate judicially-led protocols to reduce school push out and inappropriate referrals to court. The School Pathways to the Juvenile Justice System Project provided technical assistance to 16 sites across the U.S. working to reduce referrals to the juvenile justice system. 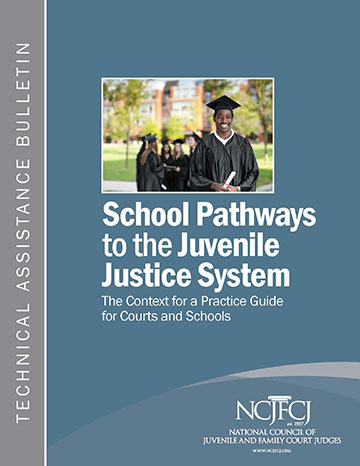 The School Pathways Project published two Technical Assistance Bulletins to provide a context for courts and schools regarding the need to reduce the number of referrals to the courts, along with a history and impact of zero tolerance policies and a second bulletin to serve as a practice guide to provide the multi-system collaboratives with thorough and thoughtful guidance on implementing judicially led collaborations to address "school pathways to the juvenile justice system." The School Pathways to the Juvenile Justice System Project became the foundation for the School-Justice Partnership Project launched in 2015. You can download our Technical Assistance Bulletins by clicking on them below.